My review of award-winning Arbonne Skin Care. Their products are researched thoroughly and made of the best natural plant elements. VIDEO: I'm Going To Australia!! This week I'm going to Melbourne and I am so excited! Please share your tips for long haul travel in the comments below, and don't forget to subscribe. I've decided to merge the photos of my last few days of Rome into one blog post. After waking up with the regret of having too much singing and too much dancing (bittersweet signs of a great day), I hobbled over to the mirror to assess the remnants of myself since half of what I wore to the wedding was now strewn across the floor, an obvious indicator that I was in a hasty bid to remove those beautiful but deadly heels. My hair, oh my hair…it was a tumbleweed of dead curls that once had the bounce of life. Once! My face? I looked like a new specie of a Ginger Panda...and I'm saying no more about that. The only thing that could have solved it all was a good cup of tea and something ridiculously sweet…but even on the continent that doesn’t apply since all European teacups are the size of a tea light candle. Of course, I found a Sephora and it co-ordinated with my outfit. 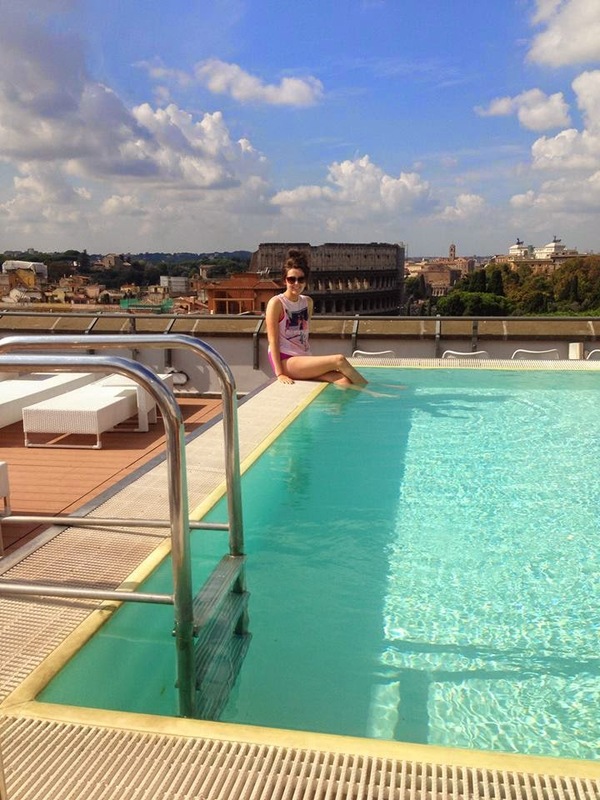 After I got my fix at Sephora we met up with friends at the pool which had a spectacular view of the Colosseum. Can I live like this all the time? My friend Aoife and I decided to treat ourselves to a little visit to the hairdressers (We were too lazy to do our own hair) as we were going for dinner that evening. We then were ready for dinner. After sunbathing, playing our own made up version of water volley ball in the pool and the trip to the hairdressers I was left with a fierce appetite. Stephen, me and a great guy, Conan. On our last day my boyfriend and I got up early, had breakfast and made our way to the Vatican Museums that led to the Sistine Chapel. We joined in on a tour, allowing us to avoid queuing for 4 hours. I cannot begin to describe the sheer opulence and divine ambience that I felt as I walked through the galleries and anticipating the Sistine Chapel. The beauty and the realism of the sculptures, statues and paintings almost made me doubt that they were done by the hands of humans. Unfortunately, they did not allow photography in the Sistine Chapel, and whilst people still took photographs, I abided by this rule out of respect. I can only tell you to go to Rome, despite your religion, and experience the city that, despite being an ancient one, will always have the most architectural, historical and beautiful magnificence on this Earth. I recently posted about Elite Aesthetic Treatment Clinic and their novel approach to helping clients enhance their own beauty as opposed to changing it and trying to stop the natural aging process. I was looking forward to my Hydro-Facial that I was invited to enjoy by Elite. Like I mentioned in my previous post, I was congested and lost all sense of smell and taste, not to mention my sinus pain. So you can imagine how it was a luxury to be invited, by the lovely Sarah, a qualified beauty therapist specializing in skin and body care treatments, to go into a room that was filled with a calming ambience. With soothing music, low lighting and beautiful scented candles, I knew I was in for a treat. I lay down on the beauty bed and was wrapped with a lovely blanket as the lights were dimmed lower. Sarah was using ARK products in this treatment. 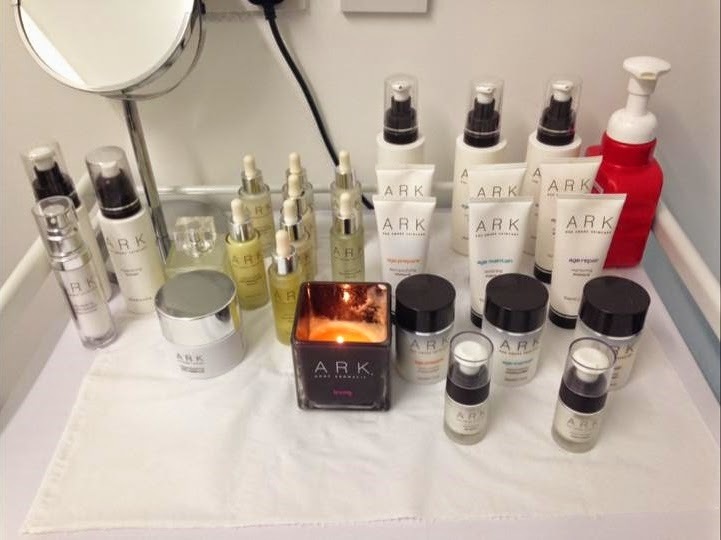 ARK Age Aware Skincare caters to the skin age rather than skin type. It’s divided into three segments: ‘Preparing the skin for teens to early 30s’, ‘Maintaining Age for Mid 30s to 50’ and ‘Age Repair for 50 and beyond’. - Sarah then gently exfoliated my skin with a soothing massage technique. -My skin was then steamed with a facial steamer, and this did absolute wonders for clearing my sinuses not to mention clearing my pores and giving my skin a good jump start. - A mask was then applied, and by this stage I was near sleeping as Sarah worked magic with her hands massaging my face. I was left for a few minutes whilst the mask set in. -Sarah then heated oil up with her hands and applied it to my face. The oils smelled so beautiful and aromatic. These were used to firm, hydrate and nourish my skin. - I was then left to enjoy some time on my own, relaxing with the aromatic oils and the soothing music. It was quite the idyllic 15mins. Since having my facial my skin has been on it's best behaviour with no breakouts. I've also noticed that my makeup applies and looks a lot better. Thanks to Emma and Sarah at Elite for the lovely treatment, and I’ll definitely be back. If you'd like to book yourself in for a facial, or another treatment, please have a look at their Facebook Page and Website.